Humans haven't been exploring Mars very long, and already we've left some litter on the planet. Several robots have explored the planet's surface, from the 1970s Viking Missions to the ongoing Mars Exploration Rovers, Spirit and Opportunity. Our newest spacecraft, the Mars Reconnaissance Orbiter, has a strong enough camera that it can see the bits and pieces of these robots on the surface. For example, here is a satellite picture of the rover Opportunity's landing platform, forever standing in the middle of Eagle Crater on Mars. This picture was taken from a distance of about 160 miles above the surface of Mars, and the lander is only 10 or 12 feet across. In coming months, the Marso Reconnaissance Orbiter will look for the Viking 1 and 2 landers, the Mars Sojourner Rover, and maybe even some of the failed landers, like the Mars Polar Lander that shut off its rockets while still about 150 feet above Mars and crashed to the surface. 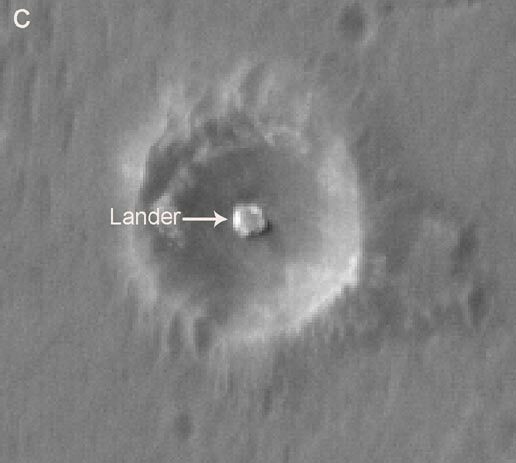 Such a picture might clear up the mystery of what happened to the lander. Further, pictures of now-defunct spacecraft can help us to learn about the weather on Mars. How fast does dust get blown around the surface? Can we see any other changes since the last pictures were taken? And so on. It's that festive time of year! It is this time of year when the typical American calls on the long-repressed shark genes in our DNA, genes necessary for instinctive movements while slowly circling parking lots looking for spaces, for sniffing out the slightest whiff of a run on the toy your child MUST have, and for being able to dart into the toy-buying frenzy and emerge with a tasty morsel of "Surfing Barbie Limited Edition 2006." Are you thinking of buying that ever-popular astronomy related present this year? No, I'm not talking about Tickle-Me Elmo Apollo 13 Edition ("Houston, we have a problem. Tee-hee!"). I'm talking about a telescope. Maybe your child has seen the boxes in the department store that say "1000x magnification!!!" and show a Hubble Telescope picture of Saturn. Or maybe your wife/husband/girlfriend/boyfriend/etc. has always been interested in astronomy and you want to surprise her or him. Or maybe you just want one for yourself. What should you do? First and Foremost: Do not go into a store and buy the telescope advertising the highest magnification!!! Believe it or not, magnification over about 200x is perfectly worthless, the blurring caused by Earth's atmosphere becomes visible at that point, No matter how much higher you magnify, all you will get is larger blurry spots! Plus, many inexpensive small telescopes have poorly-made lenses, and the blurring from the poor construction can be seen at much lower magnifications. And many astronomical objects, like comets, galaxies, star clusters, and nebulae, are surprisingly large, so you don't need magnification. They need light gathering power, which depends on the size of the telescope's opening (like 60 or 90 mm) and not on magnification. Ask yourself: Is this the first telescope for the gift recipient? If so, consider getting something like high-quality binoculars with a sturdy tripod. Binoculars can be used for many things outside of astronomy. Maybe your child will lose interest in the stars, but she may develop an interest in birdwatching. Telescopes flip the image, so daytime viewing is not very useful (unless you are looking for dead birds hanging from their perches). Binoculars are also perfect for looking at nearby galaxies and bright star clusters. As a kid, I often used my dad's binoculars to look at the Andromeda Galaxy and the Orion Nebula, and I won an award for being one of the first 10 readers of "Odyssey" magazine (an astronomy magazine for kids) to spot Halley's Comet with binoculars. If you still want a telescope: If you are pretty sure that the person getting the telescope will be an avid user, don't go cheap, but don't go all out! Most of the telescopes at big stores are cheap, poorly built, and will be disappointing. Why waste your money on that? On the other hand, many camera shops have 8-inch or 10-inch telescopes that look impressive and have lots of cool features like "Go-To" pointing and computerized controls. These can be very high quality telescopes, but do you want to spend over $1000 on a first telescope? I personally would think twice. So, shoot for mid-range. Many telescope manufacturers (including, but not limited to Meade, Celestron, Orion, and Edmund Scientific) have some nice quality, relatively inexpensive telescopes. Look them up on the web! What kind should you buy? When you look up telescopes on the web, you will see lots of descriptions that may not make sense to you (unless you are an avid amateur astronomer, in which case you probably stopped reading several paragraphs ago). Words like: refractor, reflector, Newtonian, Dobsonian, Cassegrain, and so on. For a first telescope, I wouldn't worry too much about most of these descriptions. As your loved one gets deeper into astronomy, she will learn what these mean and be able to buy the next telescope for herself. For starter telescopes, I would urge you to consider one of the following: a 60-mm to 90-mm refractor , or a 4-inch to 6-inch reflector. Most of these will come with a couple of eyepieces, so don't buy more of those right off the bat. Edmund Scientific's Astroscan and Orion's StarBlast are often considered very good, rugged first telescopes (I don't get paid for saying that, by the way). And if the telescope comes with a "solar filter" that screws into the eyepiece, THROW IT AWAY, for safety's sake! Still not sure? Still confused? Then don't buy the telescope. I don't want to discourage anyone from enjoying astronomy, but a bad telescope can be worse than none at all. Instead, get your loved one a subscription to an astronomy magazine, like Astronomy, Sky and Telescope, or Night Sky. Or, buy a good book with lots of pretty pictures. Find a local astronomy club and take your loved one for a visit (which is a good place to learn about telescopes, too!). I am thankful to get paid to do my hobby. I am thankful that taxpayers support astronomy research, even though there is rarely an immediate benefit. I am thankful that we live in a Universe where it is possible to learn about worlds far from our own. I am thankful to all the engineers who build our telescopes. I'm not very handy, so if I had to build my own, I would be lucky to be able to find the sun. I am thankful for caffeine so that I can stay awake all night. I am thankful for computers, so that I can deal with large amounts of data. When you are looking for a needle in a haystack, being able to look fast is a help. I'm thankful for colleagues, who offer support, tell me when I'm barking up the wrong tree, and sometimes go to the telescope for me when I'm too tired to go. I could go on and on, but I think the pumpkin pies are calling. Happy Thanksgiving! Today in Texas the wind is howling as a cold front sweeps through the area. It's a good day to get out of town, and I'll be doing that around noon as I head for observing at Kitt Peak in Arizona. The weather reminded me of an article I saw in an astronomical journal a few days ago talking about "cold fronts" in the hot gas in a galaxy cluster. 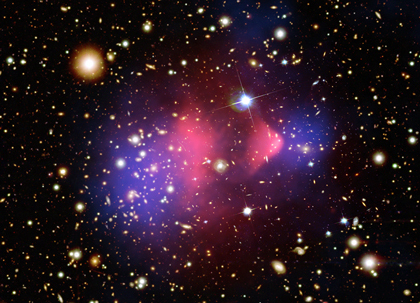 Cluster of galaxies, which can contain thousands of galaxies in an area "only" a few million light years across, often are surrounded by X-ray emitting gas that is several million degrees in temperature. A cold front can be caused by cold gas in a galaxy that has just fallen in to the cluster, or by many other complicated mechanisms. But, in many ways, they act like cold fronts on Earth -- moving through the super-hot gas and cooling it by a million degrees or so. Astronomy is hard to do in the laboratory. We have yet to make a star, let alone a galaxy or a cluster of a thousand galaxies. So we often have to look to similar processes on Earth to learn the physics that we use to understand the Universe. I remember seeing a talk about 10 years ago by scientists who were studying storms in Jupiter's atmosphere by dropping fluorescent crayons into a rotating drum of water. Another talk I saw about 6 or 7 years ago involved studying why stirring hot tea causes it to cool faster, and how that knowledge can extend to rotating stars. And looking for life in the Universe often involves trying to look at the Earth in the same way we'd look at other planets, trying to find tell-tale signs that would prove the presence of life. So, there is a lot we can learn about the universe from studying seeming mundane things, like hot tea or the weather. NASA currently has five operating probes exploring the planet Mars. The two most famous are the rovers Spirit and Opportunity, which have been crawling over the surface of Mars for nearly three years now. NASA also has three working probes in orbit around Mars: the newly-arrived Mars Reconnaissance Orbiter, the 5-year-old Mars Odyssey orbiter, and the 10-year-old Mars Global Surveyor, or MGS. The MGS just celebrated its 10th year in space -- it launched from Kennedy Space Center on November 7th, 1996. 10 years is quite old for a spacecraft, and is nearly twice as old as its planned lifetime. But the satellite seems to be showing its age. On November 2nd, NASA sent normal commands to the probe, and for some reason the probe entered a "safe mode." This means something went wrong, and the spacecraft shuts down all non-essential equipment and sends an interplanetary distress signal to Earth. Such safe modes happen fairly often in space probes -- recently the Hubble Telescope's main camera went into safe mode, the two rovers have repeatedly entered safe modes, etc., etc. The main purpose of the safe mode is to keep the spacecraft from hurting itself while NASA tries to figure out what went wrong. With the MGS, though, the situation is turning dire. After sending its "distress signal," it has said little else. Part of the reason for this may be that the spacecraft, when in safe mode, is supposed to turn its solar panels toward the sun, which moves its antenna away from the Earth. In case this is what happened, NASA is using its other probes around Mars to try and contact the MGS. But perhaps the MGS did not make it into the proper position, in which case its batteries would have run down by now. In this case, MGS will not be able to be recovered. I think its important for you all to realize that, although this sounds like it may be the end of one of our space probes, this is by no means a failed mission. MGS has done much more than we intended it to do when it was launched. It has sent back nearly 250,000 pictures of Mars, and observed four Martian years' worth of weather on Mars. All spacecraft will die eventually, and MGS has lived a full and very useful life. Hopefully it is not gone, but if it is, let's celebrate instead of mourn! Contrary to how it looks out in the wilderness, the night sky is not dark. It glows very faintly. Some of this light is sunlight reflected off of the moon or off of dust in the solar system. Some of the light comes from the gas in the upper atmosphere. And a tiny bit is starlight from other stars. Since we astronomers want to study light from specific stars or galaxies, we need to get rid of this glow. In the computer age, this is done by measuring the light from a star and measuring the light from the same size of spot in an area with no stars, and subtracting the two. And this generally works very well! Sometimes it works a little too well, and you can miss interesting things. This happened to me recently. I was looking at stars, and one of them was a little strange. 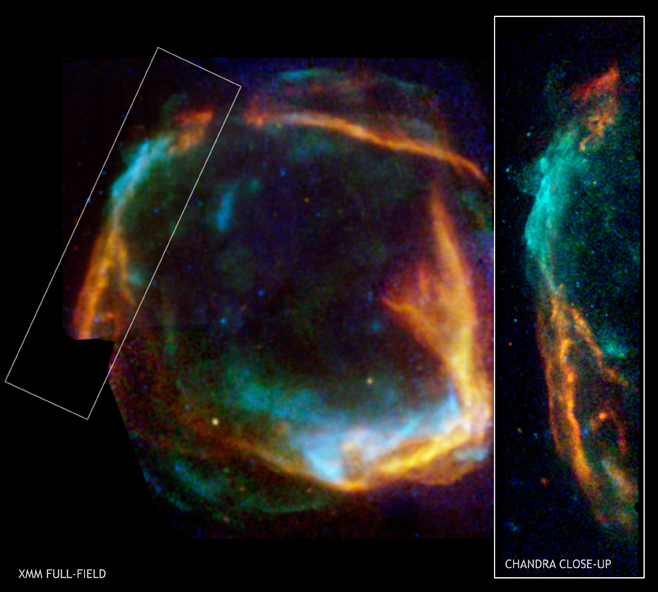 It appeared to have light coming from specific wavelengths (or exact colors) that most stars don't have. The extra light that I saw had the signature of hydrogen moving toward me at high speeds -- over 100 miles per second! There are plausible explanations for this, many of which are quite interesting. But still, something didn't seem right. When I looked closer, I noticed that my sky subtraction didn't seem to be working right for that star, so I was seeing light from the sky, not from the star. But this is still odd -- the night sky doesn't glow with the light of hydrogen, and the sky is not moving toward the ground at 100 miles per second (unless the sky really was falling. When I looked at the sky in my data for the first time, I also saw other atoms that aren't in our atmosphere. In fact, the night sky looked a lot like a nebula such as the Cat's Eye Nebula. But in pictures of this patch of sky, I hadn't seen any nebula. What was going on? After a few hours of research, I found that the patch of sky I was looking at was on the edge of the Cygnus Superbubble, a bubble of very hot gas that was made by several groups of hot stars and supernovae. The superbubble is huge -- 15 degrees across, or 30 times the size of the full moon. This is why I hadn't seen it on my image -- the light is spread over a very large area. My pictures were only 1/10 of a degree across, or over 100 times smaller than the size of the bubble. While I was disappointed I hadn't discovered anything new, there is still science that I can learn from this. And I have learned to take a closer look at the blank sky, because I don't know what it might be hiding! Today Mercury transits the sun for the last time until 2016! As a reminder -- DO NOT LOOK AT THE SUN WITHOUT APPROPRIATE SAFETY! 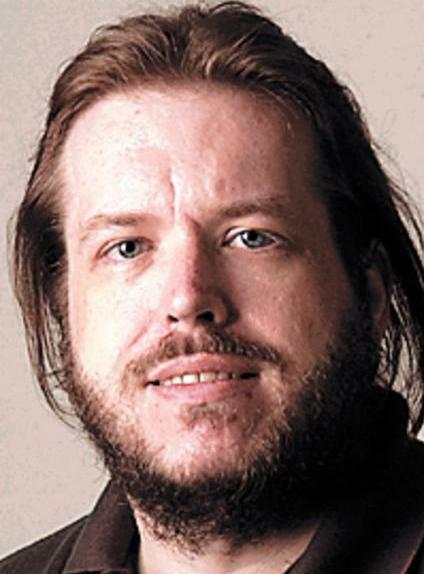 For a while, transits lost a lot of their scientific lustre. Since we knew the distances to the planets, the traversal of Mercury across the sun became an interesting phenomenon, but nothing more. That has changed with the discovery of planets in other solar systems. In some of these systems, the planet goes in front of the star as seen from the earth. We see the star get slightly dimmer (the planet only blocks some of the light, not all of it) and then re-brighten. We can learn a lot about the planet -- its mass, its size, and even its atmosphere, as it passes in front of its parent star. There are uncertainties, though. What happens to what we observe if the planet passes over a starspot? Or over a flare on the star's surface? Although we can calculate what should happen, it is better to know for certain. And that is where the transits of Mercury and Venus come in to play. With luck, the transits will pass over some of the sun's active regions, and we can observe what, if any, changes there are in what we observe from Earth. We can then apply this knowledge to what we see in transits in other solar systems, and try and figure out if a star spot or stellar flare is messing up our observations. If it is cloudy where you are, or you don't have a safe telescope, you can watch the transit live online. Tomorrow's transit of Mercury across the sun is more than just an interesting phenomenon. There is science to be had from transits, too. A couple hundred years ago, astronomers realized that it was possible to use transits to determine the distances to the sun and planets. We knew their relative distances from the sun, but we could not easily put that in absolute terms. So astronomers developed a clever trick. At different parts of the Earth, a transit begins at slightly different times because the observers are looking from slightly different angles. If you can time the start of the eclipse very accurately, and you know the distance between the two observers, you can calculate the exact distance to the planet. Unfortunately, this didn't work. First, in the days prior to atomic clocks, GPS, and even radio, clocks were just not quite accurate enough to get a good measurement. Also, astronomers did not know about the now-infamous "black drop" effect. Astronomers decided to make timing measurements at the moment that Mercury or Venus was first fully inside the sun (because it is hard to be looking at just the right instant when the transit begins). But when explorers were watching transits, they noticed that the round planet and the round sun did not break cleanly, but a little thread of black connected them for some time after the planet was fully inside the sun. The explanation of the black drop (which you can observe tomorrow if you have the right equipment!) is still unclear. It is probably due to a variety of things -- Earth's atmosphere, the atmosphere of Venus (when Venus transits), and imperfect instruments used for the observing. So, the measurements of the distance to the planets were not as accurate as was hoped. These days, we measure the distance to the planets by radar -- we bounce a radar pulse off of the planet and see how long it takes to return. That's VERY accurate! Tomorrow, we will talk about transits and modern science. No need to worry on Wednesday if you look through a solar telescope and see a black dot on the face of the sun -- it is just the planet Mercury. Every three to thirteen years, Mercury's orbit takes it directly in front of the sun as seen from the Earth. Mercury actually orbits the sun every 115 days as seen from the Earth, but most of the time it misses the sun as seen from Earth. When the geometry is right, however, we see a transit. The last such crossing was in May, 2003, and the next one will not be until May 2016! 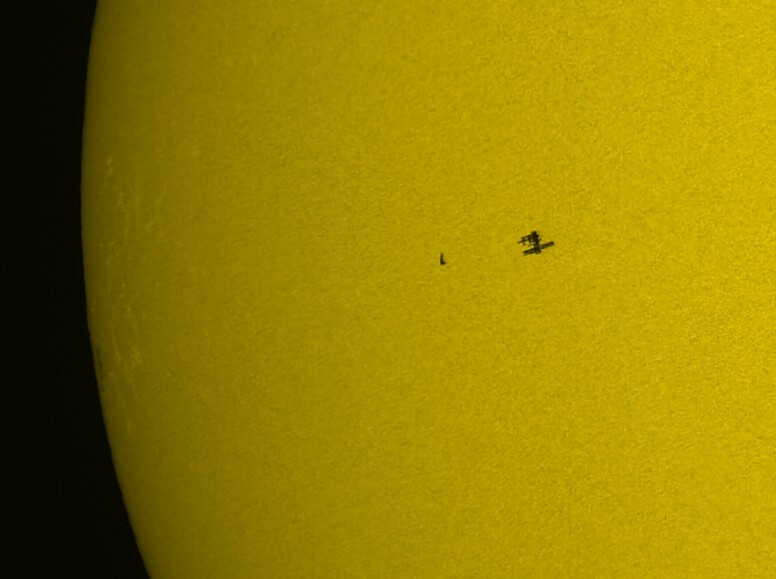 DO NOT try and look at the transit unless you are using a telescope with a solar filter! Mercury is too small to see with your unaided eye, and looking at the sun with a telescope or binoculars without a filter will blind you! Also, don't use "eclipse glasses" -- cardboard eyeglasses with Mylar filters -- to look through a telescope, because these glasses were only designed to look at solar eclipses with the naked eye. The extra light collected by a telescope could burn right through those glasses! Your best bet is to find a local astronomy group that may have a solar telescope set up in your neighborhood. If there are any sunspots visible (not many are around right now), you can notice that sunspots are actually brown when compared with the pitch black of Mercury's night side. If you live in Europe, Africa, or the Middle East, I'm sorry, but you are out of luck. The sun sets before the transit begins and rises after the transit ends. For much of the rest of the world, you can see the transit. This website will tell you what time of day you can see it. The transit lasts 5 hours, so you have plenty of time to wait for the hole in the clouds or to get out of school. In astronomy, there are two types of telescope observing. "Classical" observing is what most people think an astronomer does -- she drives up the mountain, stays up all night in the same building as the telescope, and then drives down with a car full of pictures and data. This is the only type of observing I have done. The other type of observing is known as "queue" observing. In this case, the astronomer stays at home, and the staff of the observatory does all of the observing. They may take data for several different astronomers in one night. An advantage of this type of observing is that, as the weather changes, different observing programs can be attempted. Some observing requires crystal clear weather and rock-steady skies, while other programs can be done even if we are looking through thin wispy clouds on a windy night. Queue scheduling searches for the program that can best use the existing conditions. Another advantage of queue observing is that valuable science can be done all night long. In classical observing, it often happens that the object the astronomer is interested in moves through the sky and sets before dawn, leaving the astronomer with an hour or two in which she has to find something to do. In queue scheduling, when one person's object sets, someone else's is rising. Some telescopes have to work in queue mode, like the Hubble Space Telescope. I can't drive on up to space to use the telescope -- its schedule has to be planned months in advance, and then replanned when each glitch messes up some observing. There are disadvantages to queue scheduling. Since the astronomer is not there, the astronomer has to rely on other people to take the appropriate data. Sometimes in an observing run you point at the wrong object, perhaps you have bad coordinates, perhaps your finder charts (pictures of the sky you will be pointing at to help you find your target) are bad. In classical observing you pull up the internet, do a few minutes of searching, and figure out what is wrong. In queue observing, at best the observer gives up and moves on, at worst he or she takes pictures of the wrong thing, and uses up your time on a worthless object. Queues are also less flexible. Suppose I am going to the telescope in January, and in December somebody "scoops" me by publishing data on the object I was going to observe. In classical mode, I just switch to a different object, but I still get my telescope time. In queue mode I can cancel my observations, but I can't put a new one in. McDonald Observatory is partners in the Hobby-Eberly Telescope (HET), a large telescope with a mirror about 30 feet across in West Texas. Because of its unique design, the HET must be run in queue mode. It is set at a fixed angle, and so can only look at things 55 degrees above the horizon, giving it a donut-shaped view of the sky. As objects go across that donut (it takes about an hour), they can be observed. So, with lots of astronomers having lots of objects spread around the sky, something is always crossing the donut. But if I were to go and use the telescope myself, chances are good that, for much of the night, nothing I want to look at would be visible! My co-workers and I were given 13 hours (about one night) of total time on the telescope this past week. Our observations will be placed in a queue to be observed sometime between January 1 and April 30, probably just as one hour here and one hour there. But I have to turn in all of my materials that the observers will need (finding charts, lists of targets, how long I want to look at each target, what camera I want to look at each target, and so on) by the end of next week. So, there's a lot of work to do in a short time to prepare. And, since this is my first time doing queue observing, I am hoping that I don't mess up! Yesterday's holiday, Halloween, is an astronomical holiday. Therefore it is only fitting that the astronomy department had a big party, including trick-or-treating, pumpkin pie, pumpkin soup, and a costume contest. My costume is shown above -- I was Captain Ahab, searching with my Handy Spyglass Telescope (HST) for the elusive White Dwarf. But the winning costume was built by one of our computer gurus, who was a human-sized LEGS mini-figure. Alas, I don't have pictures of her costume yet. For some space humor, try today's Strange Brew comic strip.